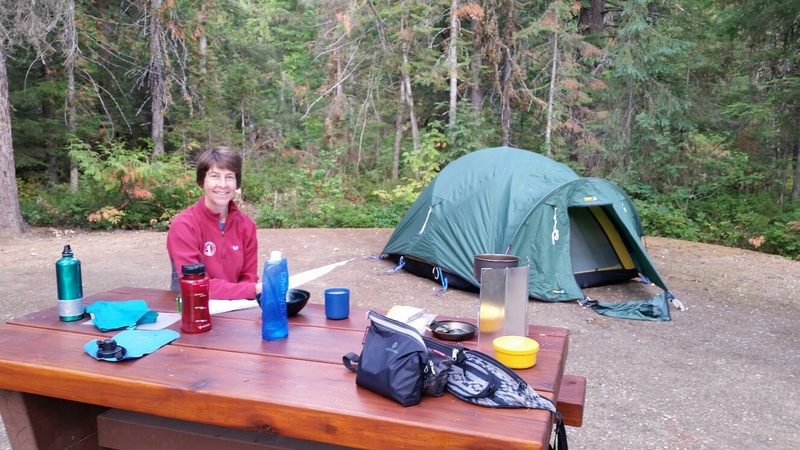 On a cool, cloudy morning we enjoyed a strawberry based camp breakfast (top picture) and a chat with Dot before setting off up Highway 16 and the Miette road - a 65 km journey. 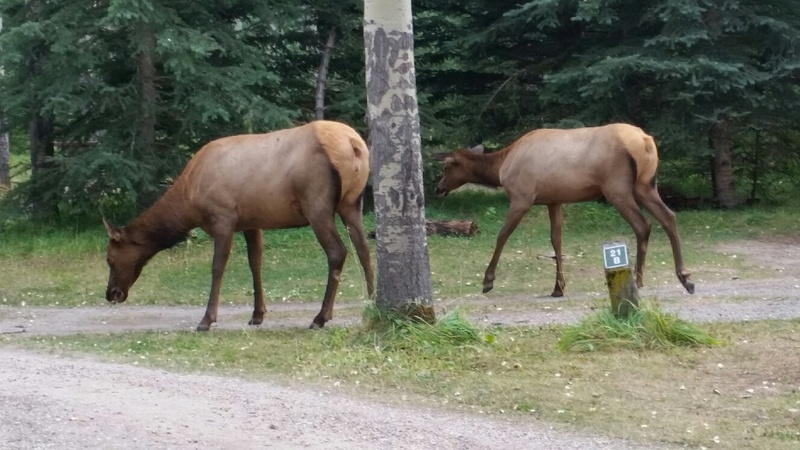 We had to leave before 10 am as all the roads around the campsite were being closed to allow the 4-day Tour of Alberta professional cycle race to pass through. 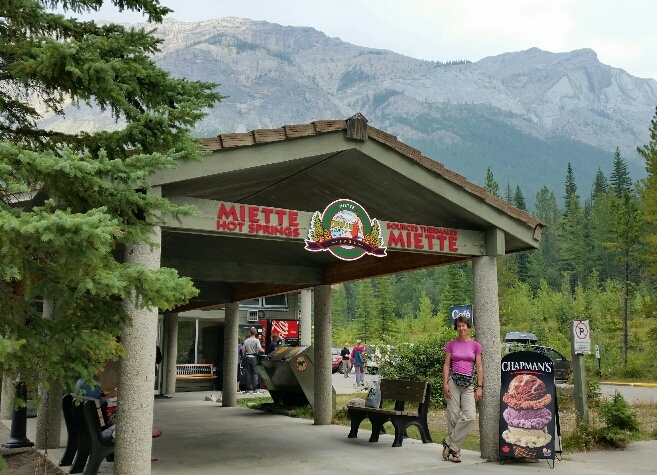 A coffee shop duly obliged at Miette, then we donned boots for the third day running! 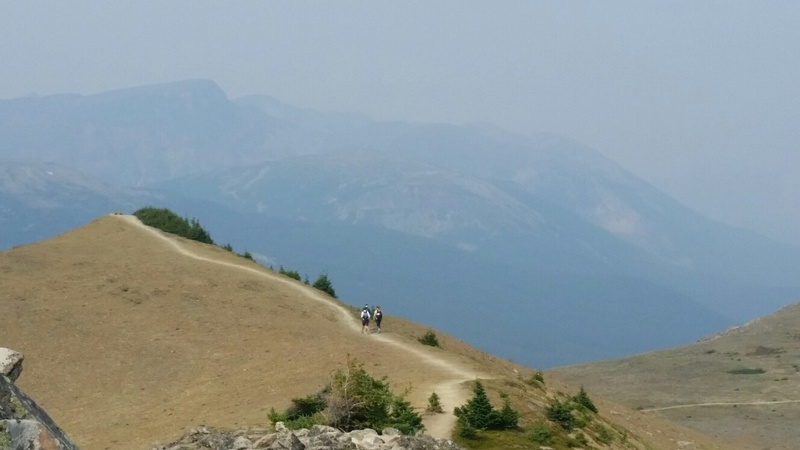 The Sulphur Skyline trail is a 4 km path to the 2016 metre summit known as Sulphur Skyline. It's a beautifully graded path through trees, with increasingly frequent glimpses of nearby mountains. Today those mountains were shrouded in the pall of smoke that remains in this entire area. 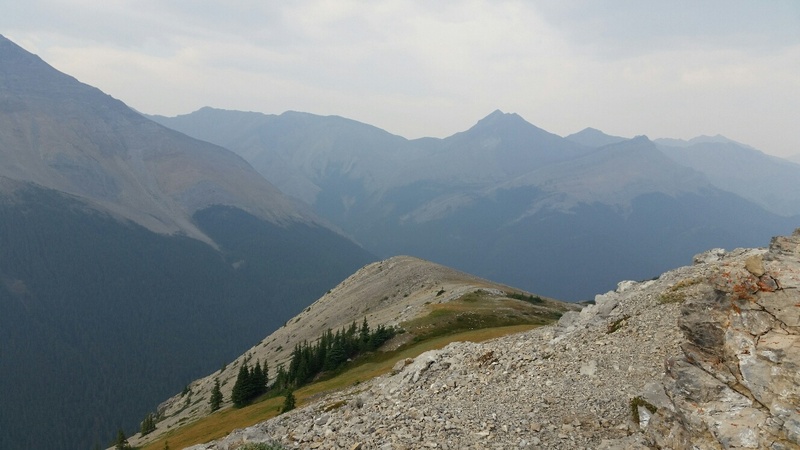 The last half kilometre to the cool, breezy summit is above the tree line and would sport fine views if you could see them. The second, third and fourth pictures give an idea of the ambience. It was however a very jolly atmosphere up there, with numerous different nationalities competing for the politeness award for taking pictures of other groups and couples. Back at the tree line we enjoyed lunch on a bench with a view that could have been stupendous, but for the smoke haze. I'd normally take a picture of our lunchtime view. If I had done, it would have been very similar to today's fifth picture, taken nearby as we continued our descent, without the flash of colour provided by the girl in the foreground. We were back at the car park by 2pm after a very easy descent. Shame about the smoke. No amount of smoke could detract from our next indulgence, which amounted to two hours in a hot bath in the excellent company of a lovely Czech couple, Eva and Aleš. It was good to meet you two and we hope you stay in touch by email. The Hotsprings have been commercialised into four different pools, at temperatures of 16, 18, 38 and 40°C respectively. The first would have been too cold for me. The second I ventured into briefly en route between 40°, which I found too hot, and the 38° pool that we all lingered in almost indefinitely. $5 well spent! Sue then drove us carefully back to Jasper, where we enjoyed burgers and fine beers outside the Jasper Brewing Company's restaurant. 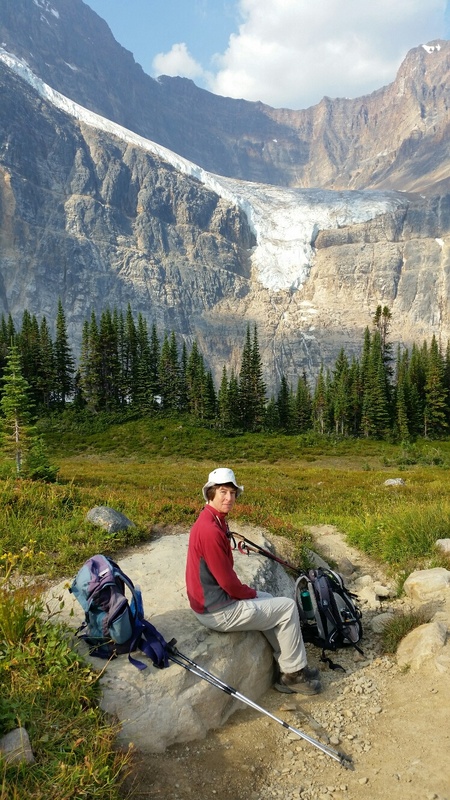 TVs blighted the dark interior, so we were delighted to be able to share a table outside with a mother and son from Seattle, and when they had gone we were joined by Dillon, from Saskatchewan, who had spent an exciting day on his own climbing Opal Hill, a nearly 3000 metre summit near the Maligne valley roadhead. 8.4 km with 700 metres ascent, in 3 hours. 130 km for Charlie. It has been a cooler day today, partially cloudy, with a maximum of around 23 degrees. Our permit allowed us onto the Cavell Road between 8.30 and 11am, so we were up around 7.30am for a chilly breakfast of strawberries with our cereal and yogurt. It took around 45 mins to drive south on Highway 93A, then up the twisting and fairly narrow Cavell Road, to the roadhead. We could now see the reason for the permit system introduced for 2017; the car park was small because the area was being enlarged so is currently a building site, presumably for a larger car park. Originally I had planned to walk route 21 to Verdant Pass, but it was 7-8 hours and some of it was pathless, so we stuck to the more popular Cavell Meadows trail. 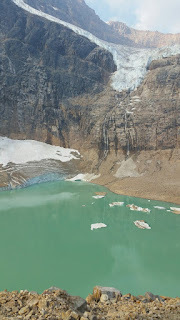 The first viewpoint looks over to the higher Angel Glacier on Mount Edith Cavell (3363m and named after an English nurse who looked after soldiers in WW1) and the lower Cavell Glacier, which overhangs Angel Lake, that has chunks of ice of various colours floating on its green water. The path continued behind the rocky moraine, where pika were making their homes, collecting green material, presumably to line their holes for hibernation. They have no tail, and large ears. It got cooler in the wind as we climbed above the tree line but once we'd reached the last viewpoint, it looked easy enough to continue to another higher point. And so it went on... We eventually reached a summit at around 2564m, which gave views all around, albeit hazy, as usual. We could look across at Mt Edith Cavell, with the narrow ridge leading to the summit, and the full extent of Angel Glacier, so named due to the wings of ice that seem to project out from the main descending part. We shared the summit with a family from Seattle, and ate part of our lunch, before the cool wind forced us to start the descent. It was fairly quick, as we'd taken the longer paths on the route up, so had the short steep paths to descend. At a path junction, we ran into the couple from Chicago again, who told us that they had seen five bighorn sheep after we saw them at Medicine Lake yesterday. A large crack, not in the direction of the building site below us, was due to a chunk of Angel Glacier breaking off and tumbling down the rocks below. It was an impressive sight and a lucky one for us. Lunch part 2 was eaten just beyond this point, where we were pestered by two ground squirrels who wanted to share the food! They were brazen, climbing up next to us and on to us. It wasn't far back to the car park, for an early return to the campsite, where, thankfully, the keys for the food locker were on the table where I had left them this morning. We had both been worrying that they would have been taken by a bird wanting something shiny, which would have left us with the problem of having to get the padlock sawn off to access the food, and, more importantly, my sleeping bag, which was acting as insulation to keep things cool. We had a relaxing hour or so, reading and drinking tea, from 3 to 4ish, before driving to town to restock the larder. The AG Foods supermarket was better than the small one we'd used before. Back to the elk. This afternoon, an elk wandered through nearby, eating grass and tree shoots. 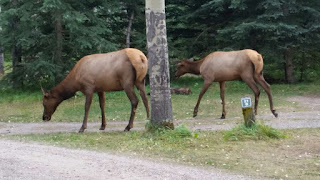 When we returned from the supermarket, there were two elk walking around together, one of whom sat down nearby. She has just quietly walked off. Lovely. 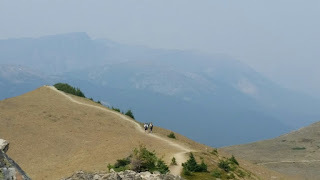 Thanks Sue, that's a pretty comprehensive account of this smokey day on which we also saw Gray Jays and Clark's Nutcrackers - both known as 'whisky jacks' and notorious for stealing food from unwary visitors. 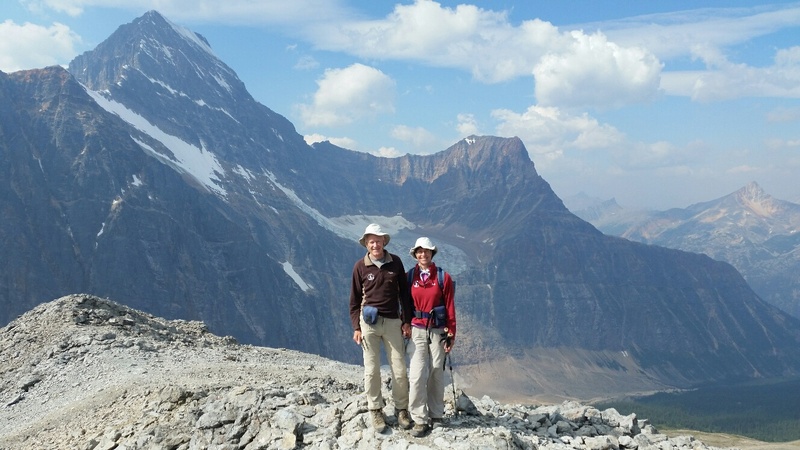 Today's first picture was taken on the drive up to the Cavell Meadows roadhead, the next two are views towards Mt Edith Cavell and her glaciers, then, after Sue is shown at 'elevenses', we are both pictured on the ~ 2564 metre summit (we can't find its name but it was our highest point of the trip to date). The final picture was taken just near our tent. 10.5 km with 800 metres ascent, in less than 5 hours. And for Martin, 4 km by the river in 22.45, featuring yellow butterflies with brown fringes, and an elk. Radio contact is alive and well. After hastily drafting yesterday's entry I established that whilst there's no WiFi here, the washrooms have power points and there's a good phone signal. So I bought some data. I regretted that when I looked at the cricket scores. And the news. 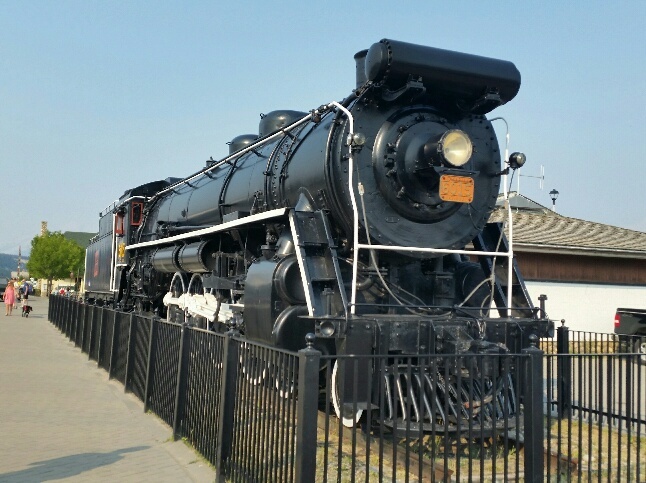 The railway engine pictured yesterday is part of the heritage trail around Jasper, which has a history of two competing railway companies that overstretched themselves and went bust, to be replaced by Canadian National Railways. 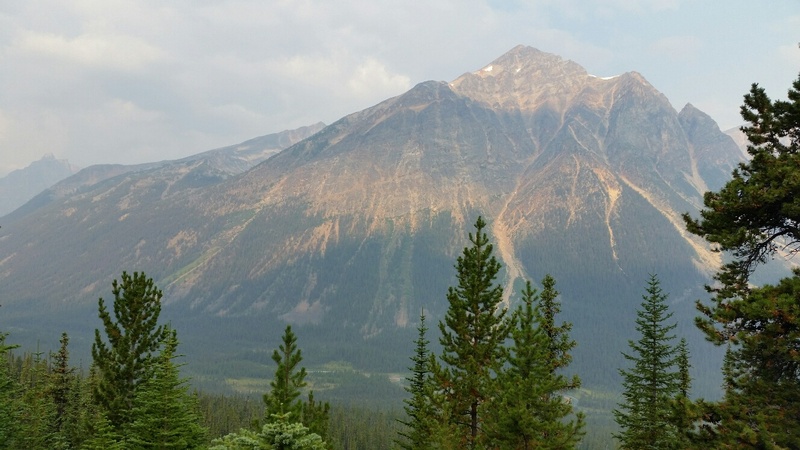 Jasper's origins are linked to the development of Canadian railways. We had planned to be in a queue outside Jasper's Information Centre for road permits to the Edith Cavell area by 8am. Waking at 7.30 made that a slight challenge. This benefited us, as having missed breakfast we had every excuse to visit The Bears Paw Bakery for a takeaway fresh brewed coffee and the biggest cinnamon buns you've ever seen. That was our reward for queueing for a good half hour on a cool morning chatting to a couple from Chicago. Result. We got the permit we needed for tomorrow morning. 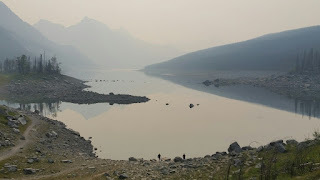 As we'd been waiting the sun had risen, not over the relatively close mountains (Jasper is situated in a wide bowl with most of the surrounding mountains a little way off) but over the thick haze of smoke that seemed to have blown in overnight and has remained all day. Back to camp to get sorted, then a 50 km drive to the roadhead at Maligne Lake. On the way we passed Medicine Lake, which fills with water during the summer as the snows melt into it. 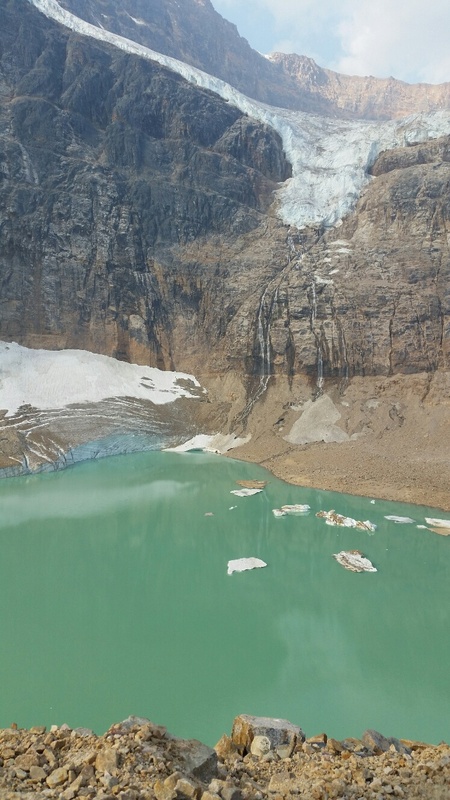 The water drains through small plug holes during the winter, emerging about 17km down the valley. Various attempts have been made to block the plug holes, but the old mattresses and the bundles of magazines that were used didn't pass muster! What must be a remarkable underground cave system has yet to be explored as no suitable access point has been found. 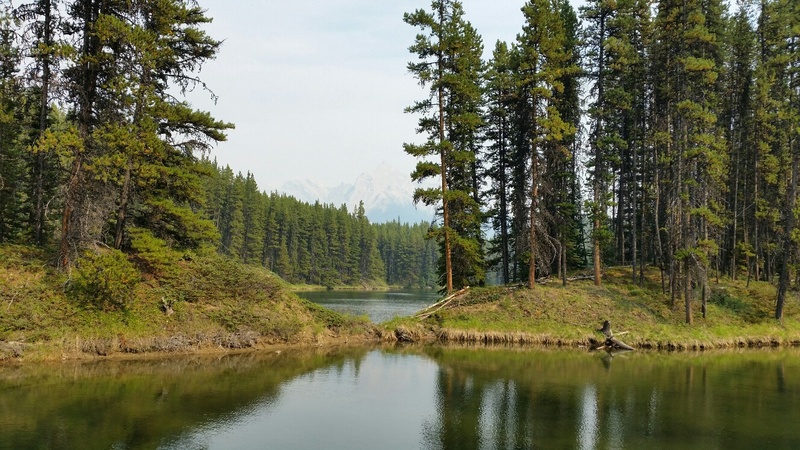 Medicine Lake is the site of a massive fire that took place in 2015 as a result of a lightning strike. Today's first two pictures show our smoke blighted view down the lake, and the burnt trees in a picture taken from the same place. 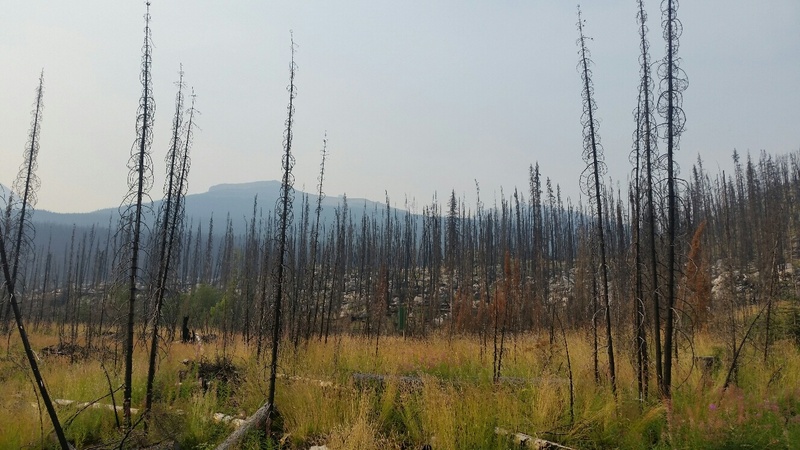 It was probably the smoke from the 2015 fire that affected Robert, Lyn and Louise's views as they passed through this area. 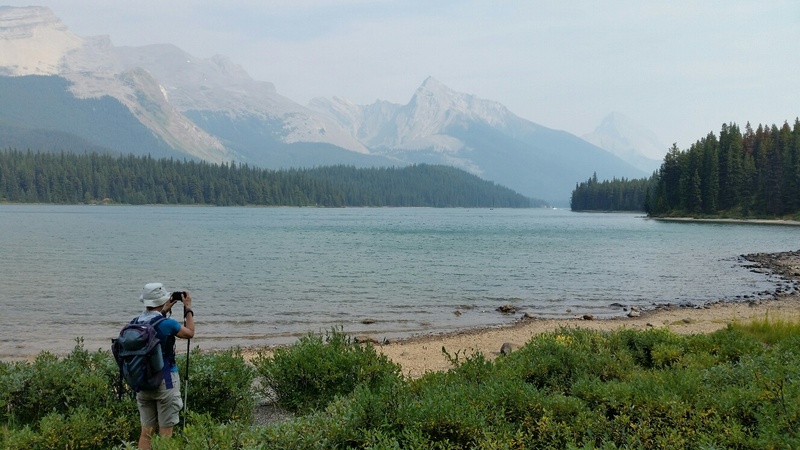 Having parked at Maligne we donned our boots and marched for 5 km up a gravel track lined with chirruping squirrels and chaffinch like birds, emerging at a fine lunch spot with (on a normal day) a great view across Maligne Lake. Today's view is shown in the third picture. 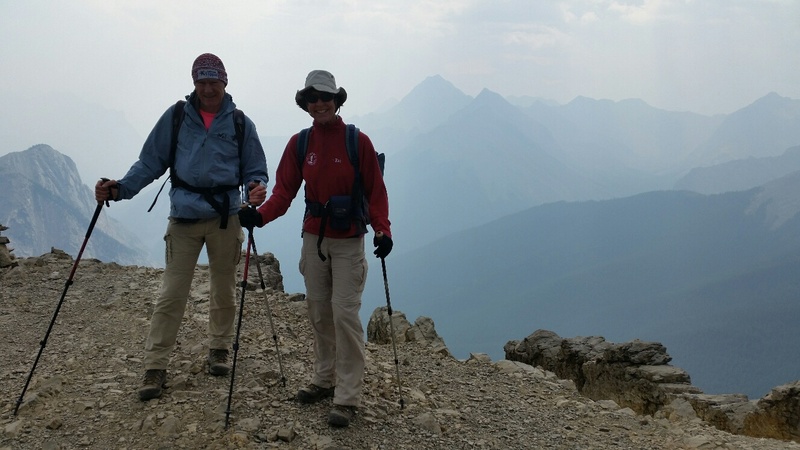 An English couple joined us on this first Bald Hill summit. The two couples vied to attract a resident ground squirrel without actually giving it any food (that's illegal). See 4th picture. 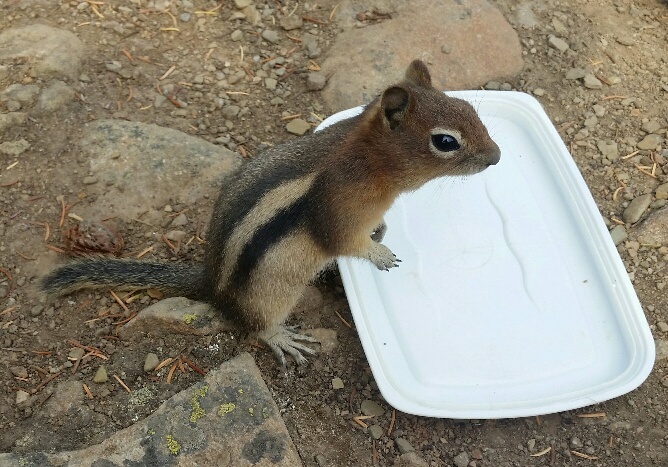 Ground squirrels are similar to chipmunks but their heads aren't striped. After lunch we continued on to the second and third Bald Hill summits, past willowherb flowers (5th picture) and clumps of saxifrage and moss campion. Earlier we had noted various clovers, willow, mountain avens, Indian paintbrush, heather, fringed grass of Parnassus, buttercups, fleabanes and long stalks of lousewort, to name but a few. There would be far more flowers earlier in the season - you can sense the turn towards autumn here. 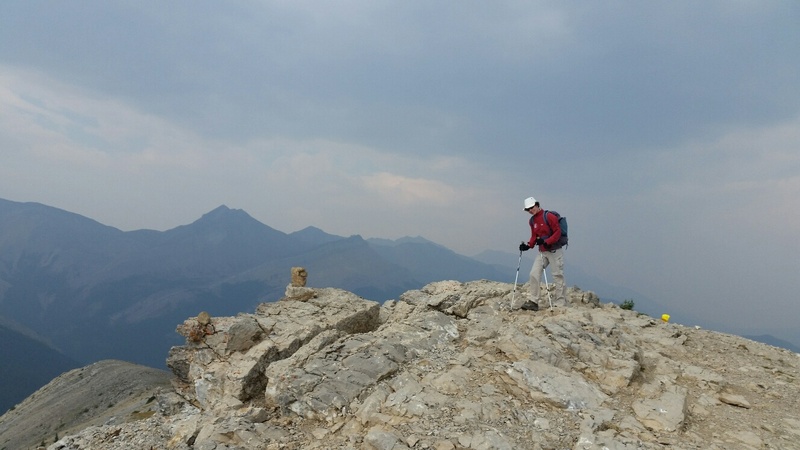 Our third summit was at 2325 metres according to my GPS. Our highest point on the trip to date. The sixth picture was taken from here. 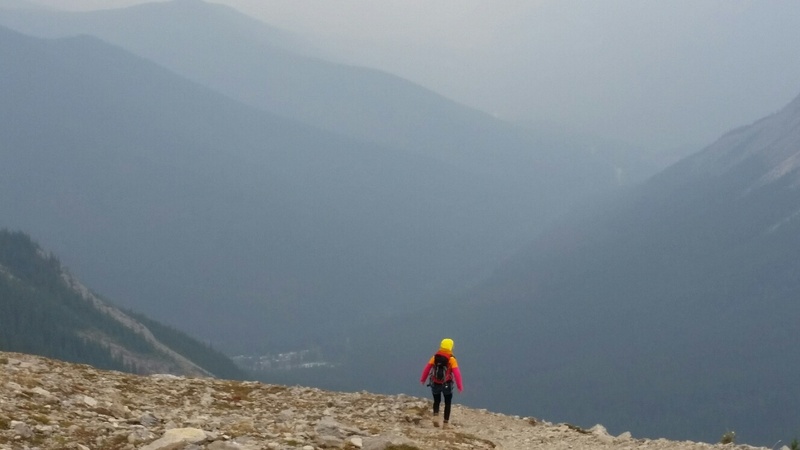 We decided not to venture to a further summit, from where the smoke laden but otherwise wonderful views would have been very similar. Instead we chose a circuitous descent, on which Sue is pictured on the path, seventh down. Arriving at a path junction after an easy descent, mainly avoiding the steep gravel up which we had ascended, we turned through pleasant woodland to visit Moose Lake (8th picture). There were now more people around as this is close to the car park. 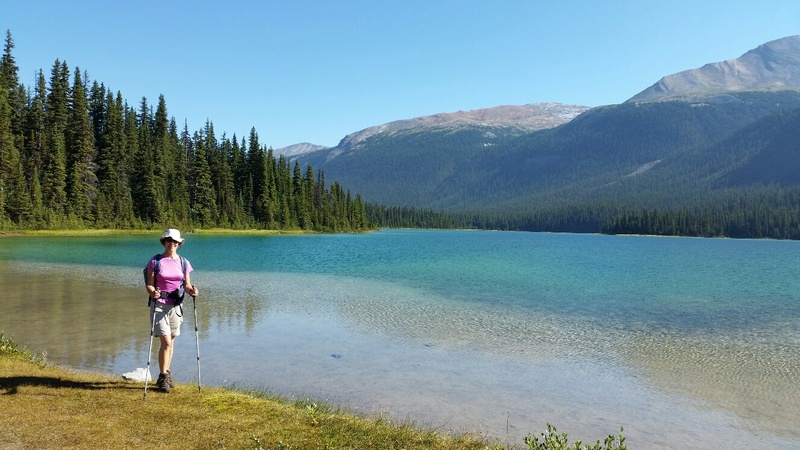 The Moose Lake loop path then emerges at Maligne Lake (9th picture), before emerging at the car park. This was an excellent outing, albeit the would be wonderful views were blighted by the smoke haze. We pootled back to Jasper at the statutory 60kph and called in to Papa George's Restaurant for fish and chips and large beers before heading back to camp, where the chatter of the Explore group has been replaced by the groan of a campervan's generator. 15 km with 700 metres ascent, in 5 hours. 120 km for Charlie. After another excellent breakfast of pancakes smothered in maple syrup, with fried eggs and turkey sausages, we took our leave of Claudia and Curtis and their other friendly guests. Driving back towards Clearwater, past the Terry Fox Mountain rest area, we soon reached Rearguard Falls (top picture), another place where the Chinook salmon reach a final insurmountable barrier. Other guests at the lodge had seen them jumping, but we were out of luck again. 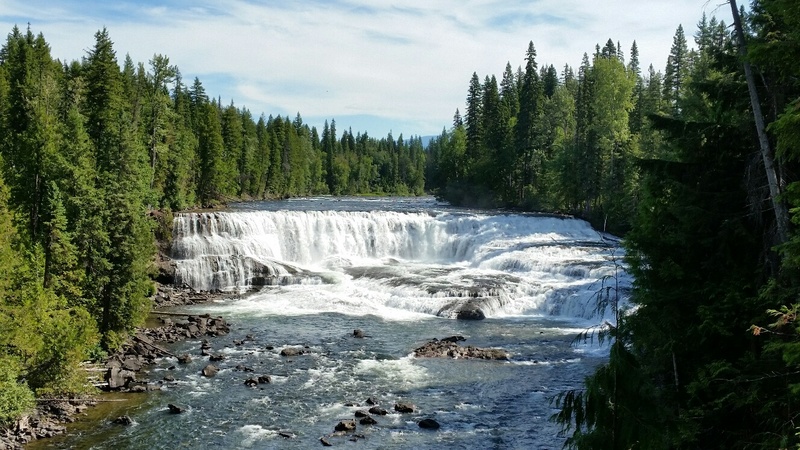 Nice falls though. 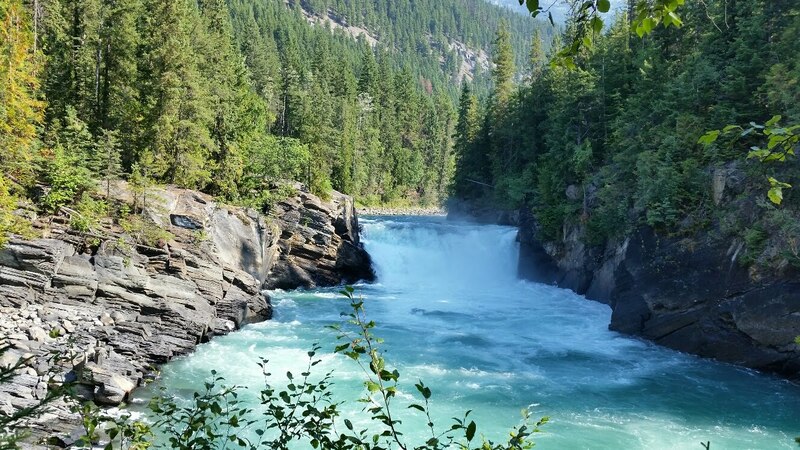 Our next stop was at Overlander Falls (third picture), where in 1862 a hundred and seventy five men and one woman rested on their journey from Ontario to the newly discovered goldfields of British Columbia. The group split into two here. 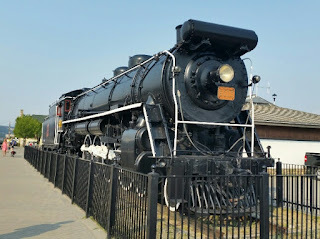 Most of them never made it to the goldfields of the Cariboo, choosing instead to settle in places like Kamloops. We entered Alberta, lost an hour, and proceeded to Jasper for a picnic lunch in the shade of a tree on a lawn next to the high street. 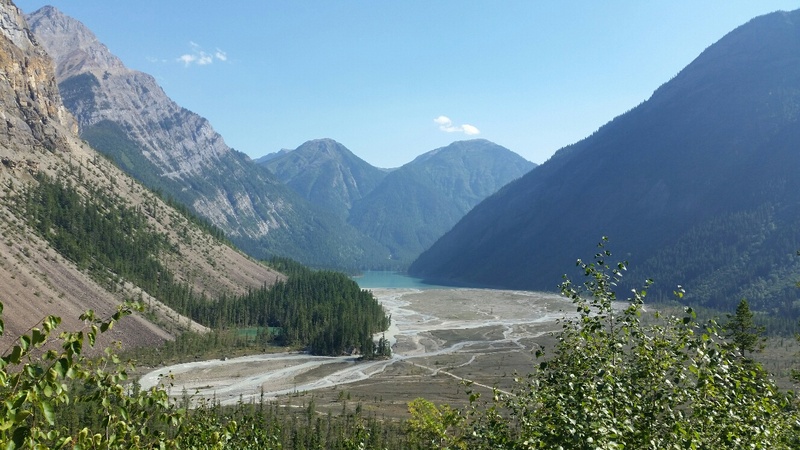 Jasper is a small town about the size of Aviemore, but a bit smarter. We were booked on position K22 of a gigantic campsite, Whistlers Campground. Apparently there are 700 pitches. Luckily they are spread over a wide area. 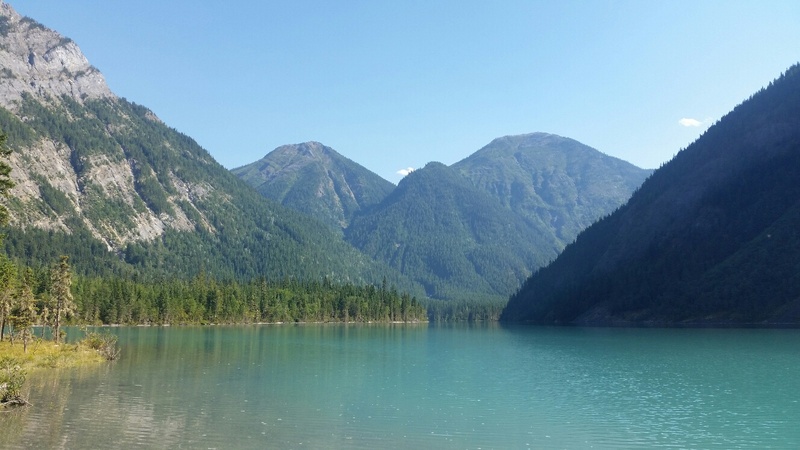 We are next to an 'Explore' group who are on a whistler stop tour. After a planning session - we are here for six nights and needed a plan - the tent went up and we decided to go for a walk. It was about 4.30. It was 4 km into Jasper, partly beside the Athabaska River (fifth picture) and 8 km on a Heritage and Nature trail that circumnavigates the town. Then back 4 km to the campsite, where we took some time to find K22 and finished up doing about 17 km. Anyway, by then it was after 6.30 and a cold beer was most welcome. It's very hazy here due to smoke from the fires that were apparently being stoked by lightning strikes whilst we were enjoying a snow storm at Sun Peaks. Pasta with mushrooms and portobello mushroom sauce, with tuna, went down well, preceded by avocado and caesar dressing and followed by our staple diet of strawberries and cream. 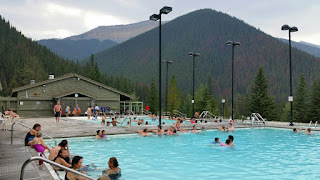 The showers were then tested and were found to be as good as all the other facilities here. 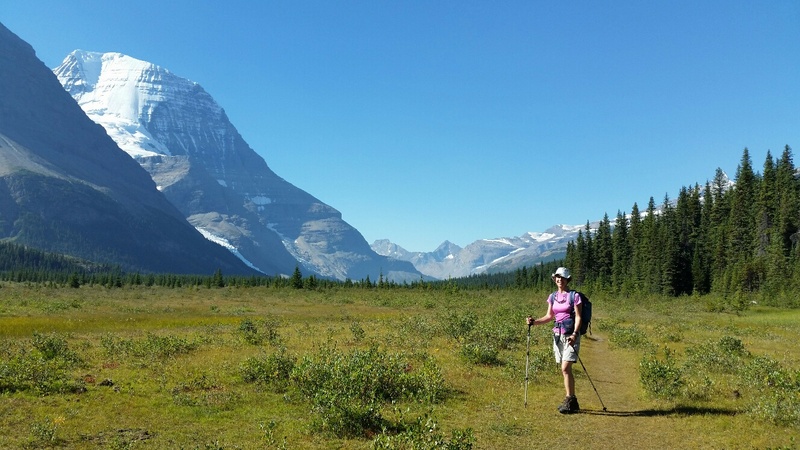 2 km bimbles and a 17 km dash around Jasper in 2.10. Plus 110 km in Charlie. When we arrived yesterday, Curtis and Claudia recommended the walk from Berg Lake to the trailhead. "It's an excellent 21 km walk" asserted Curtis. 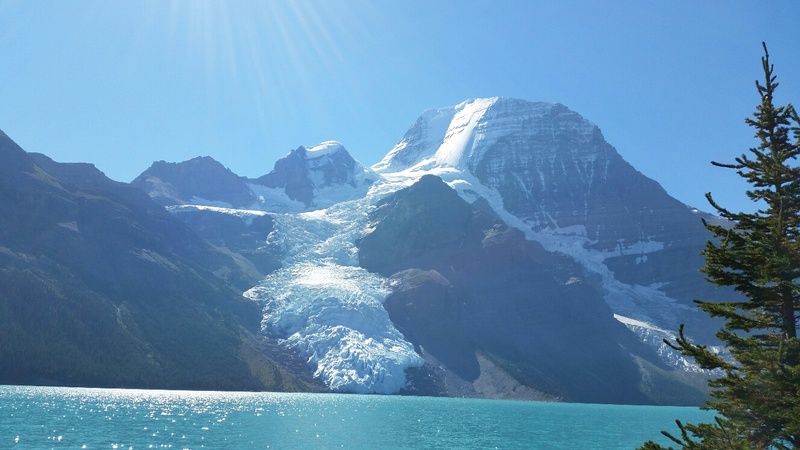 But how to get to Berg Lake? It would be a long walk in and a long walk back - a 42 km day in hot weather. We checked the options and found them to be fully booked. We'd have to walk in as far as we could, then retrace our steps. "I'll see what I can do in the morning" quipped Curtis. Alarm was set for 7.30am and lunch made. Breakfast was granola and yoghurt with strawberry and rhubarb compote, then egg nests. These muffins with a nest of ham with an egg baked in it had just been delivered when Curtis announced that there were two spaces on the helicopter if we wished to take them. We ate quickly then grabbed our bags and boots and drove a short distance, past the Visitor Centre to the heli take-off area. Jim and Ellen, the Americans we'd met at dinner last night, were waiting for their lift, which would take them into their campsite for 4 nights. They had been ready to go for some time and envied our breakfast. 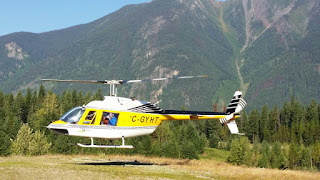 Around 9.45am, once everyone else had headed off, we had our turn, with Matthew from Helimagic, and the pilot. I sat in the front seat, with the window open. It was a fabulous 8 minutes in the air, with the trail below us, and views of lakes, waterfalls, glaciers and mountains surrounding us. 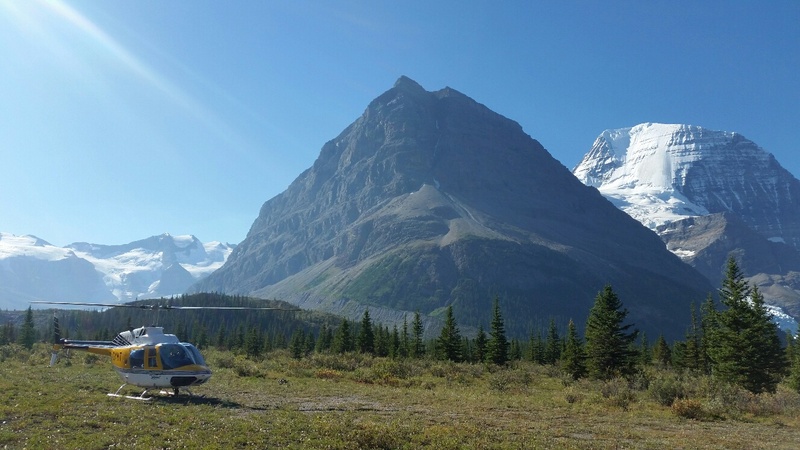 We flew into Alberta before landing in British Columbia at Robson Pass, around 1700m. 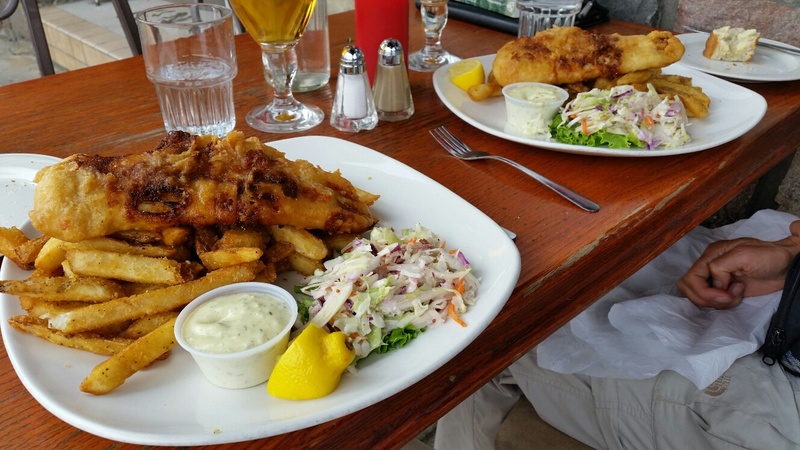 Now, we had a 23km walk back! 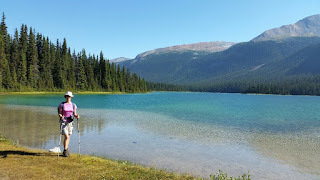 Adolphus Lake, in Jasper National Park, was close, so we walked out to this lake, close to the Robson Pass, before turning round to visit Jim, Ellen and Peter, at their campsite, where we chatted for some time before continuing. The Robson glacier could be seen on the left, as we arrived at Berg Lake, which is an amazing blue colour, and into which the Berg Glacier calves, creating chunks of ice in the water. 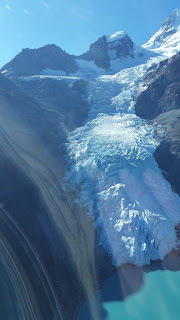 Lateral moraine can be seen to either side, showing the original width of the glacier. The Berg Lake Campground was passed, with tent spaces made from squares of wood, with chippings on which to pitch. Beside the path one-flowered wintergreen, Indian paintbrush and fringed grass of Parnassus were still in flower. Beyond Berg Lake, an open area of streams before views of Whitehorn Mountain appeared, a steep pyramid of rock. The view from today's picnic bench was down the valley, with waterfalls spilling down the mountainside, and just at the start of a 4km sustained downhill section. With no clouds in the sky, it was a warm day, particularly in the sun. 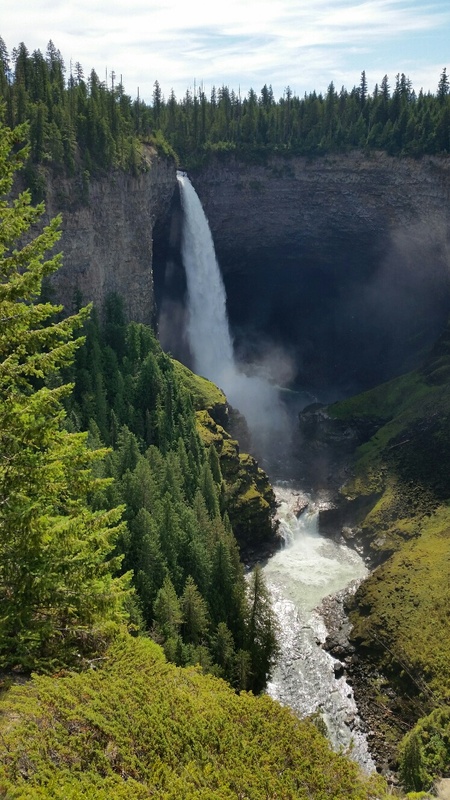 The Emperor Falls were huge, creating a fine mist of cool water and soaking the rocks. A little lower were the Falls of the Pool, another multilevel waterfall crashing down the mountain. The trail weaved in and out of the trees, and beneath a cliff near White Falls, a long cascade beneath us. 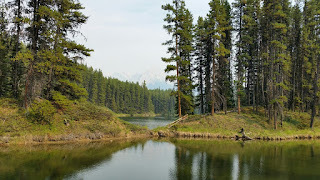 There were bridges to cross, campgrounds passed, a blue river joining a silty grey one, before Kinney Lake, where the trail gave us some ascent into dappled, mossy woodland, with red bursts from the bunchberry growing by the path. A last water and biscuit stop was taken in a wooden shelter at a shady table. 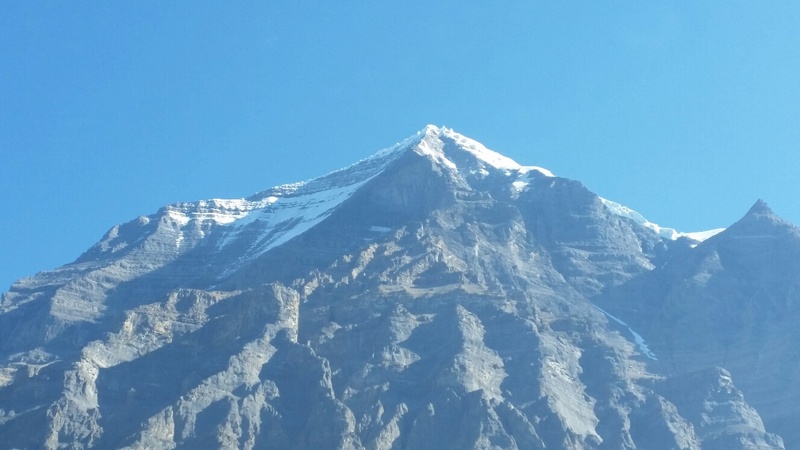 We chatted to a Swiss man who had been at university in Sheffield for 5 years, who was in a group of four who had been up and back to Berg Lake, starting at 7am. 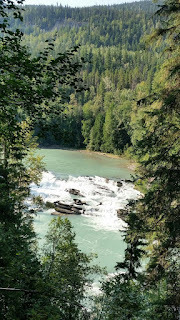 Beyond Kinney Lake, the trail descended gently and we gained speed in the cool shady woodland, with big cedars and the rush of the white water next to us. Back to the car at 5pm, it wasn't far back to the Lodge, where a cup of tea was welcome and a pile of washing was not! 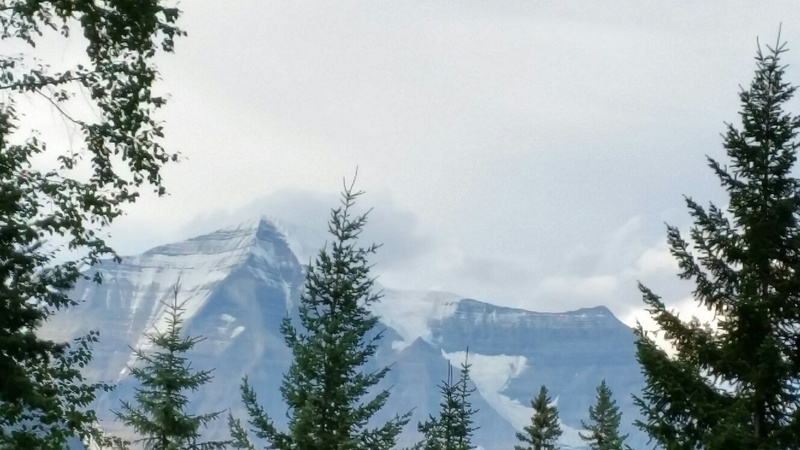 Showers, beers and dinner with a couple from Staffordshire, Mark and Sue, made for a relaxing evening, with a cloud-free view of Mt Robson from the dinner table. Thanks Sue, you should do this more often! Today's pictures are chronological as usual. 23 km hike with about 100 metres ascent and 1000 metres descent. 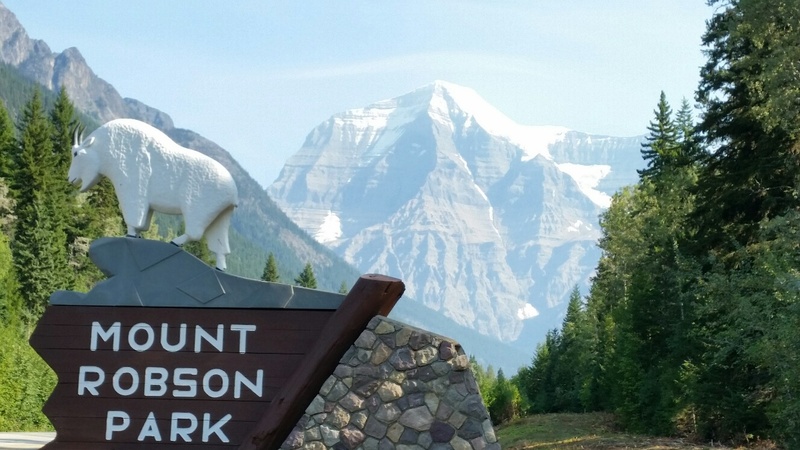 Mount Robson, 3954 metres, is the highest point in the Rockies. 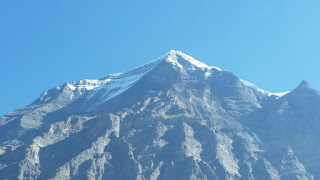 Its summit is reputed to be visible on about 14 days each year. 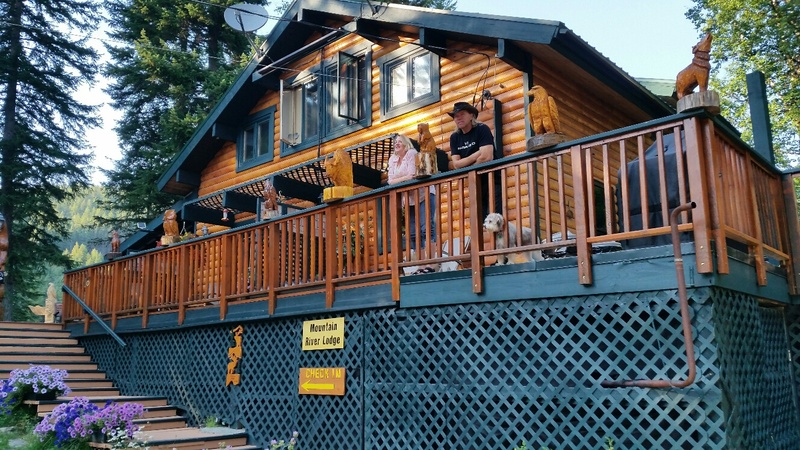 It is pictured above from the verandah on which we are enjoying a just out of picture beer before dinner at our better than last night's accommodation, Mount Robson Mountain River Lodge. 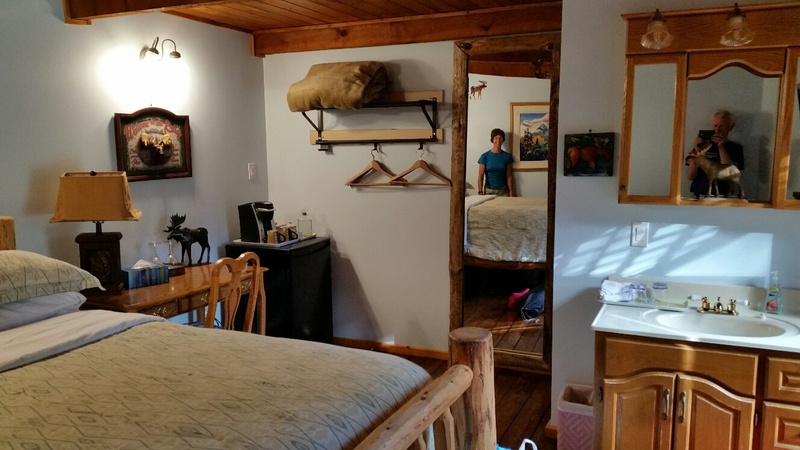 We have a lovely room with a separate entrance. 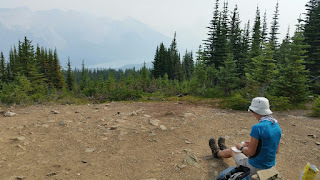 If Robert is reading this he will be pleased to hear that we stopped at both Terry Fox Mountain viewpoints. 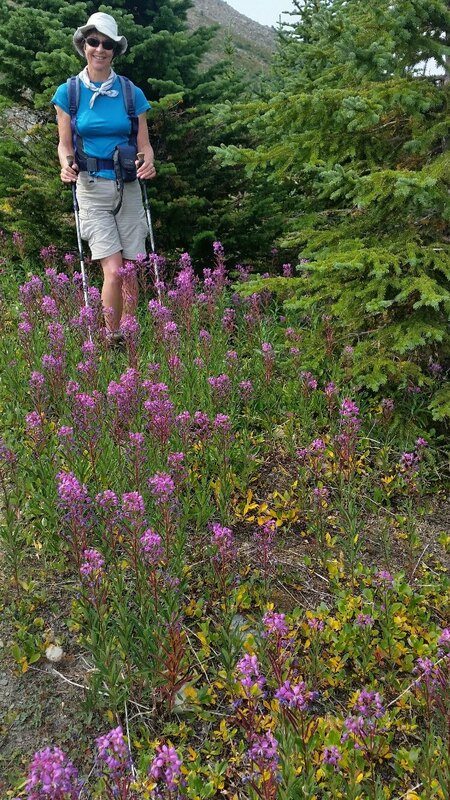 Sun Peaks was a good place to visit. 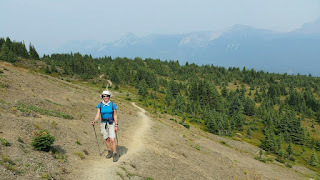 The panoramic views from the local summits extended to the glaciers of the Coastal Range in one direction and those of the Rockies in another direction. Even on an overcast day these were remarkable. 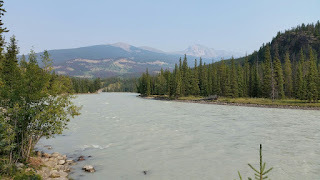 We left our comfortable room and headed back down to Highway 5, another road that's a bit like the A9, for the scenic drive beside the North Thompson River to Clearwater. 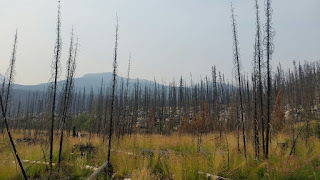 After passing wide areas that had previously been affected by fire - there were many scorched tree trunks standing like blackened matchsticks in an area of regeneration - we paused for coffee and cake in Little Fort before moving on to the information centre at Clearwater, the gateway to Wells Gray. 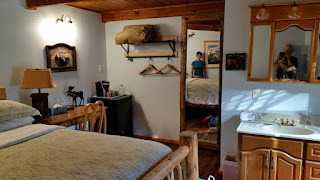 After some advice we chose to head into the park for two nights. 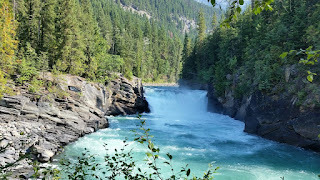 So we blithely set off up the road and stopped after 10 km at the Spahats Falls, formerly Bear Falls but renamed in First Nation language. 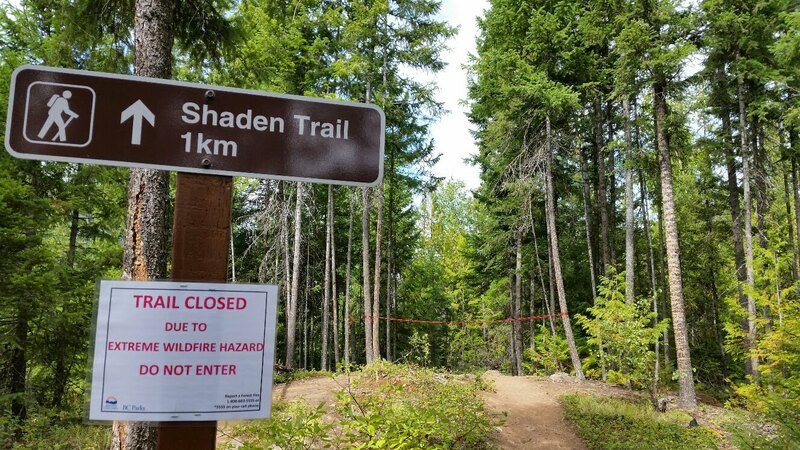 (Top picture) Normally there would be good, if short, walking routes here, but even those less than 1 km in length were closed due to the fire risk. (See second picture) The falls are about 70 metres high. We continued up to the official park entrance, 38 km from Clearwater, with another 30 km on a dirt road to go to the road head campsite. This is when we noticed the 'lack of fuel' gauge. The range of the Camry, 700 km, is rather less than we are used to. An hour and a half was spent returning to Clearwater, but hey - we now have no fuel worries. The Clearwater Lake campsite was full, but we found a space at the Falls Creek site next door. (Fourth picture) A good spot so long as you have a free standing tent that pitches on a solid surface. We could have eaten in a nearby 'nature room' but we sprayed ourselves and swatted a few mossies whilst noshing at our picnic table. 4 km sundry ambling, 300 km driving. The first four pictures were taken today. A lie in, breakfast and butty making, after discarding some items found by mice in the boot of the car. They had a feast and made some bedding. 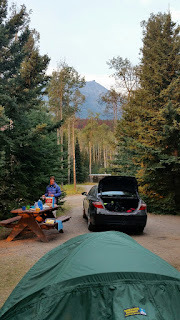 We aren't allowed to have food in the tent because bears may smell it, so it's secreted in the car, which clearly has a way in for small rodents. 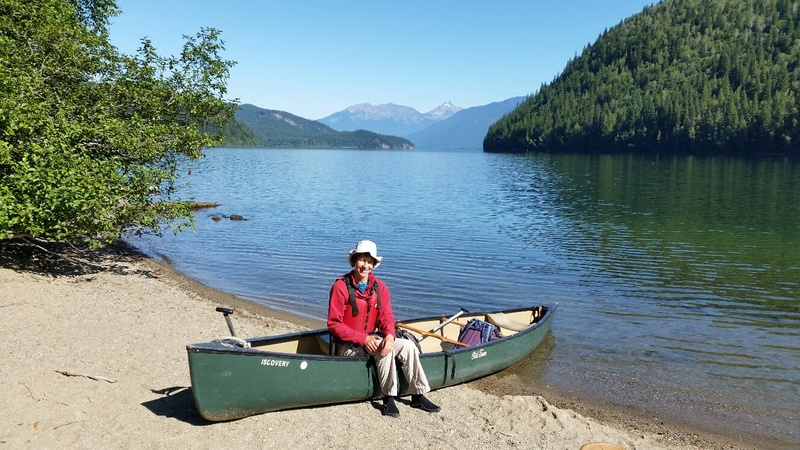 By 10am we had hired a Canadian canoe for the day and had set off up Clearwater Lake, a huge stretch of water bordered by high mountains. 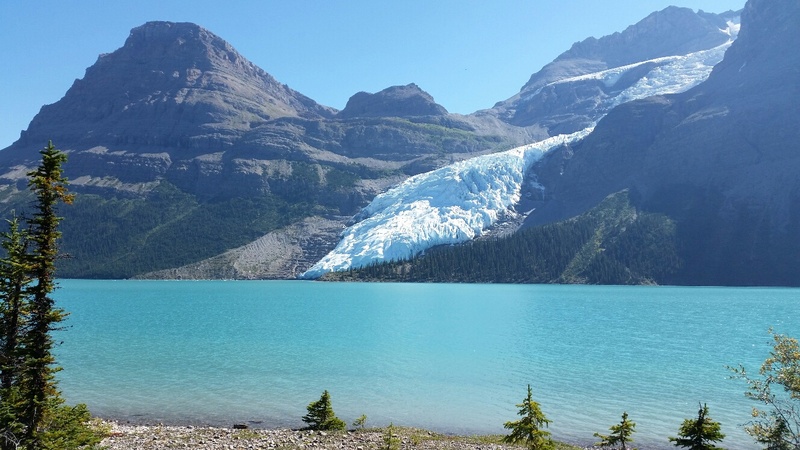 Unlike many in the Alps, this lake is full! 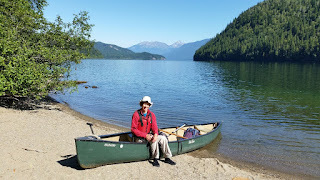 In lovely sunny weather we enjoyed a 14 km circuit, stopping at Caribou Beach for elevenses and Divers Bluff for lunch, before crossing the lake in choppy water and heading back to the canoe launch site. There were a few people out, but plenty of room for everyone. I find this type of canoe so much easier and more comfortable than a kayak. You can change position and move around, as opposed to being trapped in a rigid position with with a wet bottom. You stay dry in a Canadian canoe. 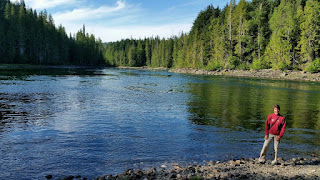 There was a shoal of giant fish by the launch point, and we saw Loons and other water birds as well as the usual squirrels and chipmunks. A beer (tea for Sue) at the Osprey Café went down wonderfully, before we strolled less than 1 km up to Sitka Falls (not pictured due to slow wifi). The 5th and 6th pictures were taken canoeing. The mosquitoes gave us a break so that we could enjoy supper at our picnic bench - avocado and egg salad, pasta with tuna, mushrooms and tomato sauce, followed by strawberries and cream. Then it was back to 'The Colour Purple' for me, having finished 'The Handmaid's Tale. Sue is reading 'Dark Matter'. I expect she would have screamed if she'd heard the mice in the car. As yesterday, today was another most satisfying one, despite its not being part of the original plan. 14 km paddling, 4 km of bimbles, plus 4 km by the Clearwater River in 25.20. We spent the morning slowly making our way 70 km back to Clearwater. The first 30 km on dirt roads, but not of the diabolical type found near Whistler. Five stops were made as we travelled south down the access corridor that is all that is open in the park apart from the lake and some Very Short trails to viewpoints. Norman's Eddy (pictured fourth from bottom) wasn't that spectacular but did at least provide us with a generous round trip of 1.5 km woodland walking without encountering any No Entry signs. There was a memorial to Harold Turner (1944-2003). 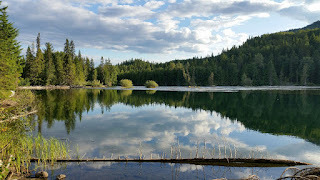 Our next stop was Shadow Lake, where from across the lake a high mountain, possibly Garnet Peak, stood serenely reflected on the lake. A nice view but too contrasty for a worthwhile photo. Bailey's Chute was our next stop. There would normally be a short walking circuit by West Lake and Mynach Falls, but as they were out of bounds we watched the torrent, pictured third from bottom, for a while. 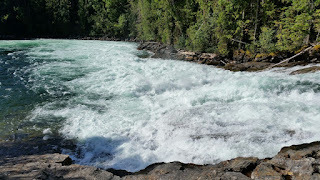 This is where 22 kg Chinook salmon can be seen jumping the eight metre plunge at this time of year. The falls were named after an engineer who worked in Wells Gray until he drowned in a boating accident just downstream from here. There was also a lot of Eyebright beside the path. Our fourth stop was for the purpose of admiring Helmcken Falls (penultimate picture), at 141 metres the fourth highest waterfall in Canada. Very impressive. Like a giant tree lined Malham Cove with lots of water. There were many information boards describing the geological features. 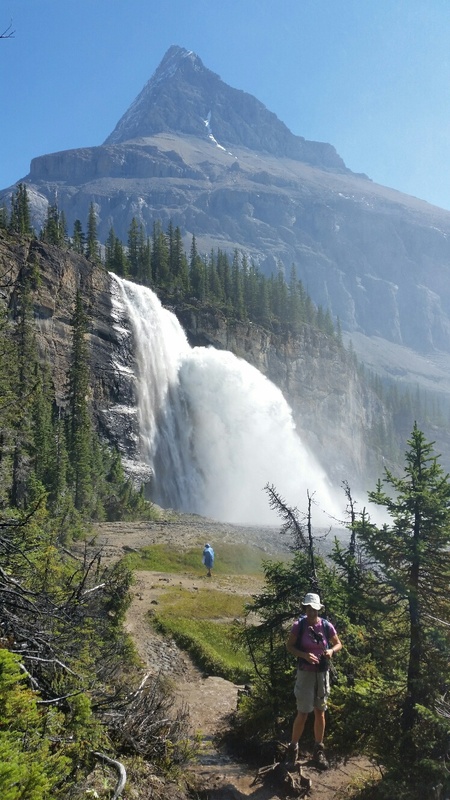 This is the highest of 39 named waterfalls in the park, with numerous more unnamed ones. Dawson Falls was our final stop before heading into Clearwater for a picnic lunch outside the information centre whilst the tent dried in the bright sunshine. There was a lot of condensation last night. 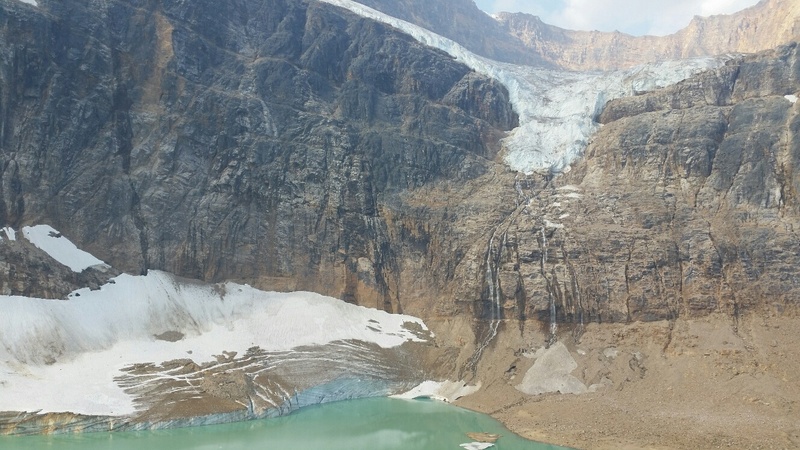 Dawson Falls (bottom picture) are modest in height but grand in extent. They are on a tributary of the Clearwater River, so the salmon don't have to jump these falls before reaching the barrier of Bailey's Chute! 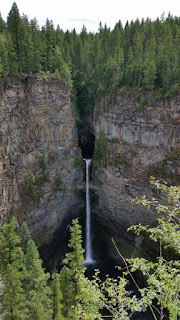 Those visits together with our movements over the last two days gave us about as comprehensive a tour of Wells Gray as is possible under the current 'No Hiking' restrictions. 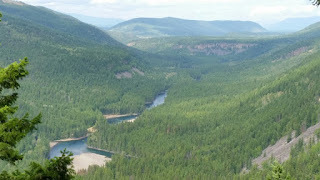 The viewpoint of note that we missed was Green Mountain - where we could have gazed down on some of the lakes and forest, and across to distant mountains. Never mind. If we'd been here a week ago we would have had smoke and haze to contend with. I am writing this as we travel north to Mount Robson, as we enter the Rockies for most of the remainder of our trip. This posting will be sent when we get there, and the next posting will cover the Mount Robson phase of the trip.